​ ​CORPUS CHRISTI – The Port of Corpus Christi just got another $23 million toward its $350 million-plus channel-dredging project from the U.S. Army Corps of Engineers 2018 navigation construction budget. The money will be used to fully fund the second of six contracts and will extend the construction from the entrance in the Gulf of Mexico to Redfish Bay. Estimated for completion in 2021-22, the Channel Improvement Project will dredge the Corpus Christi Ship Channel down to 54 feet along a 36-mile stretch. The channel will be widened to 530 feet from 400 feet, allowing two ships to pass each other. The project that is expected to increase exports of U.S.-produced energy by nearly $40 billion while increasing safety on the waters. 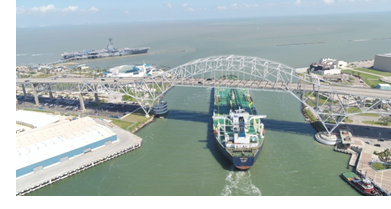 The Port of Corpus Christi is the leading exporter of U.S. crude oil and the fourth-largest port in the nation in terms of tonnage.